My recent hiking experience at Beausoleil Island in Georgian Bay Islands National Park, Ontario. It has been more than a year since I started making plans to visit the Georgian Bay Islands National Park, and finally I succeeded in making the trip this summer. As the name suggests, the park is essentially a group of islands in the spectacular georgian bay in Ontario. However the largest and most popular is the Beausoleil island. Hiking in the Beausoleil island is probably one of the most popular activity there (along with boating and camping), as the mainland is filled with kms of trails to explore. The trails at the northern end of the island are rocky and more scenic than the ones in the southern end. The island may seem small in the map, but once you start hike its land area seems extending endlessly and so spent one whole day each for the northern and southern trails. The southern trails go through forests, swamps and connects to various campsites and cabins along its way. The southern trails also allow biking in many stretches and is quite popular among bike lovers as biking is not allowed in the norther trails. The lookout trail would be the starting trail for most of the visitors as it starts from the Visitors Centre at Cedar Spring. This is relatively a short trail connecting to Treasure trail in the north and to the Christian trail in the south. The park representatives in the visitor centre suggested us that the lookout point in this trail offers scenic views but to our disappointment the lookout point was nothing but a wooden structure looking over dense woods. This is also the trail where had our first encounter with wild mosquitoes which drove us back to the trail start. Luckily the visitors centre had mosquito repellent sprays for purchase which gave us confidence to come back and continue our hike. We continued our hike through the Christian trail as this one will lead us to the western shores of the island. The Christian trail took us further through woods and we enjoyed the tall trees along the way. Mosquitoes were still hovering our heads, but we were determined to move forward with the help of the repellent spray. Christian Beach Trail led us to Christian Beach where the Park’s Christian Beach Cabins are located. After patrolling the area and gathering ideas for our next cabin stay we were chilling out in the campfire near the beach area, and thats when we had our first sight of the Massasauga rattle snake after it alerted us with its rattling sound. Moving on, we started hiking south in the Georgian trail. The Georgian trail extends along the shores of the Georgian bay on the western side of the Beausoleil Island. We had quite a long hike in this trail to reach the Beausoleil point where we stopped for lunch. The Beausoleil point offers a small picnic shelter and a makeshift mobile washroom, making it an ideal lunch stop. After a short rest and lunch break, we started off hiking the Huron trail heading back to our starting point. The Huron trail, though continued throught he woods, after a while took us to a wide open air stretch that finally saved us from the mosquitoes. 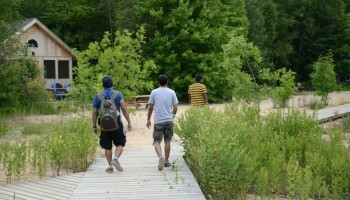 The Huron trail runs parallel to the east cost of Beausoleil Island and connects the hikers to the Heritage trail before leading us to the popular dock area near Cedar springs campsite. 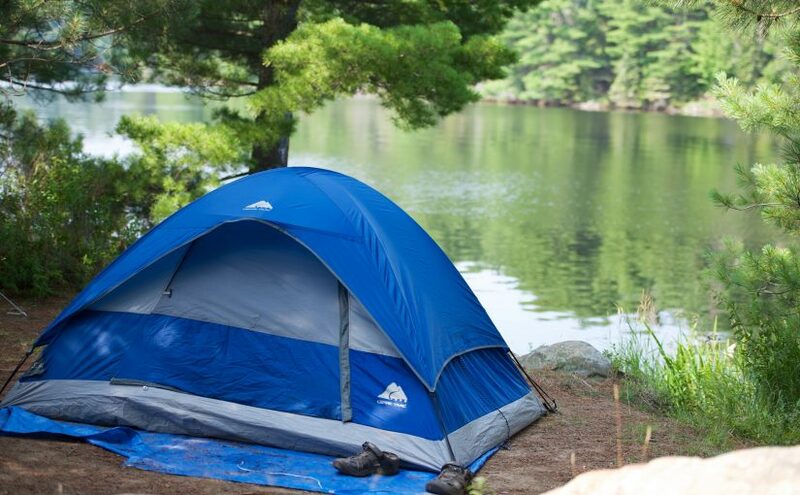 The Heritage trail is a short stretch of open road (about 10 mins walk) that splits up from the Huron Trail and connects to a popular picnic area on the eastern shoreline of the beausoleil island near the Cedar Springs campsite. The trail also goes through a small cemetery where you can stop by and read the info board that discussed the history of the cemetery. The picnic area seemed like an ideal place to end your hike, relax and enjoy the view of the water. There is also a nice docking area nearby where you can see boaters relaxing and partying in their mini yachts. The visitors centre is only a short walk from the dock area and you can consider taking a dip in the Cedar Springs beach, on the way back. Though the southern trails are not as scenic as their northern counterparts and for most part go through woods and swamps, they connect to various cabins and campsites and offer a convenient hiking experience for campers.